We eat chicken pretty often around here so I'm always looking for new ways to serve it up. It's a good thing it's one of those meats that goes with pretty much anything because there's so many different things you can do with it! This latest chicken dish was inspired by one of my garden harvests. I'm growing three tomato plants and some days, the harvest is plentiful! I walked in with a huge handful the other day and wanted to use them up pretty quickly to maintain the fresh flavor. I new I'd be making chicken for dinner but I didn't know what I'd be doing with it yet. I decided to incorporate the tomatoes somehow so the wheels started turning. Roasting them sounded so good and that idea evolved into this elegant dinner that was tangy and sweet and oh so good. 2. Line a baking sheet with foil and spray with non-stick spray. Cut tomatoes in half lengthwise and lay on foil. Toss with olive oil, salt, pepper, and sugar. Bake for 8-10 minutes or until soft and starting to caramelize. 4. Pound chicken breasts so they are all even thickness. Season with salt and pepper. Melt butter and oil in pan and cook chicken over medium heat until browned and juices run clear. 5. 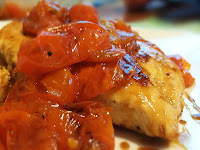 Serve tomatoes - with juices - over chicken breasts and drizzle with vinegar.